This 145 page, A4, book, copiously illustrated, gives an entertaining and informative account of the incumbents of St John the Evangelist, Old Coulsdon, from 1224–1950 with biographical and background historical details, together with similar information on the clergy of eight parishes ‘devolved’ from Old Coulsdon, 1871–1950. This study of the rectors of Coulsdon attempts to take their names from a list and to present them as ‘real’ people, to give some idea of their background and their lives beyond the parish of Coulsdon, where they came from and where they went on to, if they did not die in the service of this parish. In order to give some idea of the historical context in which they worked, some information is given on developments in the church and in religious thinking in England. These biographies start with the earliest known ‘parson of Coulsdon’ and continue until the end of World War II. 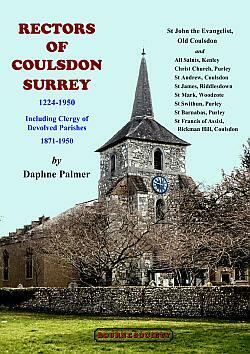 In addition, Part 3 covers the clergy who served in those parishes which were formed wholly or partly out of the ancient parish of Coulsdon, ie the churches in Coulsdon, Purley and Kenley. There is a wide variation in the amount that can be found out about these men. During the earlier period, in some cases it is not possible to say anything about a priest, except that he came to the parish at a certain time and left it at some later date. Sometimes we do not even have this information; we only know that he must have been the incumbent during a certain period because there is a reference to him in a contemporary document. Before the introduction of parish registers (1538, although many have not survived from that date), family details are much more difficult to trace. The upheavals of the Reformation and the period of the Interregnum following the Civil War in the 17th century cause further problems. However, in many cases with the aid of standard reference works on the more notable families of Britain and on the universities of Oxford and Cambridge, through the consultation of a wide range of publications and the increasing amount of information becoming available on the internet, it has proved possible to build up a picture of the rectors and their families. Several of the later rectors came from the landed gentry or had links with the aristocracy and interesting information regarding their antecedents can be gleaned from works such as Burke’s Peerage. Early on in this research it was discovered that many of the names on the published list of rectors, and indeed on the board in the church, did not belong to Coulsdon at all, but were rectors of Woodmansterne. This applied to the 14th century and the discrepancy arose from errors in Manning and Bray’s History of Surrey, published in the early 19th century. For more details on this, see the article by the present author in the Bourne Society’s Local History Records, 45, (2006) 72-79 (Rectors of Coulsdon in the 14th Century: A Re-examination of Existing Lists). As a result of this, the number of rectors to be studied was reduced considerably. On the other hand, a number of names have been found which are not on the church list or mentioned by Manning and Bray but who were without doubt rectors of Coulsdon. Inevitably, it has proved impossible to find out some details, even about comparatively recent incumbents. There are also one or two real mysteries, which might be resolved by further research, for example the cause of death of Edward De Chair (Rector 1737-1749). There comes a time however to call a halt to the research and to commit to paper the information gathered. This I have done in the hope that it will prove of interest and will bring to life some of the names of Coulsdon’s past rectors. While writing these biographies I have always been aware that in the background there were the curates, sometimes poorly paid, sometimes bearing the main responsibility for the ‘cure of souls’ in the parish, while the rector was elsewhere. These hard-working clergy do not appear on church lists but one hopes that they were able to proceed in due course to a living of their own. This book is therefore dedicated to these unacknowledged men who laboured in the service of the parish.